Klein’s Impact Sockets are offered in 4-in-1 Square and 2-in-1 versions. 4-in-1 Square Impact sockets come with 3/4, 13/16, 1 in. and 1-1/8 in. square sockets and feature hollow shaft and fits 1/2, 5/8 and 3/4 in. pole hardware. 2-in-1 impact sockets feature cross-hole design for preventing unintentional adapter separation. Unit’s 6-point design reduces round-off with contacts to flat sides of hex fasteners whereas 12-point design for use with square fasteners. Klein Tools (www.kleintools.com), for professionals since 1857, introduces three new impact sockets. Both the 6-point and the 12-point 2-in-1 Impact Sockets are great for pole hardware installation and removal with two coaxial spring-loaded hex sockets in one tool. 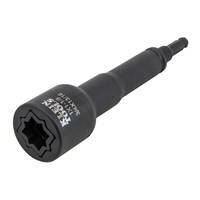 The 4-in-1 Square Impact Socket’s longer shaft is for use on long threaded bolts. All models feature hands-free adjustment between socket sizes, saving the amount of time tradespeople spend completing each task.